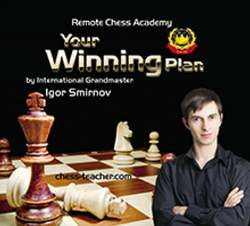 Study UNIQUE Chess Teaching Videos from this remote online Chess Academy run by Grandmaster Igor Smirnov (UKR). 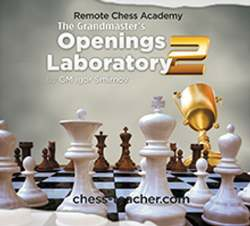 Do you Want to make your chess training two or even three times more effective? Opening, middlegame, or endgame. Whatever phase or aspect of the Royal Game you want to master, my COMPLETE Chess Courses will give you that DRAMATIC boost you are looking for! The coupon called 'aday' gives you a 40% discount! 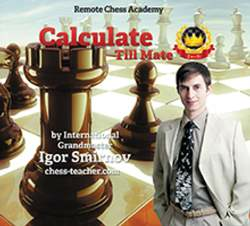 You can become an expert or better if you study these high quality Chess Teaching Videos. 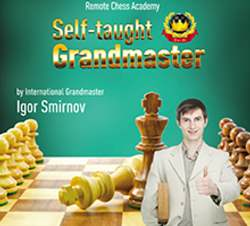 This unique and efficient chess teaching system has been developed over many years by chess grandmaster Smirnov who knows exactly what you need to learn to be able to play good chess quickly. 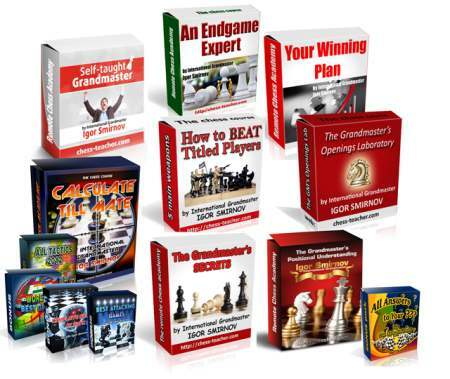 Grandmaster Secrets contains the MOST essential principles of chess. Showing you how to think like a strong player step-by-step. Get It Now - Click here! Know the secrets of proper and efficient opening preparation. With a complete opening repertoire, this is a must-have. I suggest that you first study other courses, for example GM's Secrets or Positional Understanding. It is better to have a solid knowledge of chess and, after that, study the opening course above. Get It Now - Click here! Master the 5 Chess Weapons and learn how to defeat opponents that are 200 or even 300 rating points ahead of you. Planning is one of the MOST important skills in chess! Learn how to read the chess board and plan like the PROs. This is your guide towards high chess achievements! You will know WHAT and HOW you should train PLUS the best training materials. To break through the small league, the elite circle of REALLY strong players, you need to take your UNDERSTANDING of chess to a DEEP and CRYSTAL CLEAR level. Get it Now - Click here! Train your tactical eye with the best training materials. If you buy the courses in packages together you will get a HUGE discount! SAVE! 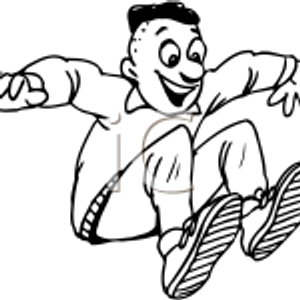 Get Packages for a big Discount - Click here! 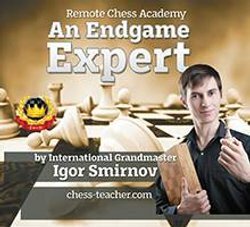 "GM Igor Smirnov is not scared to be honest telling you what the professional chess player actually does today." We live in an age where there is a lot information in the form of chess books and videos. The problem is they are copies from a database without explanation, or they are moves that provide a superficial explanation of the position with the view to meet the level of the average club player. Knowledge is provided, but omit the needs of the progressive student. No IM or GM wishes to give their own secret analysis because they want to keep it to themselves for their own use. Hence, why club players don't improve because the source information is concealed. By contrast GM Igor Smirnov is not scared to be honest telling you what the professional chess player actually does today. 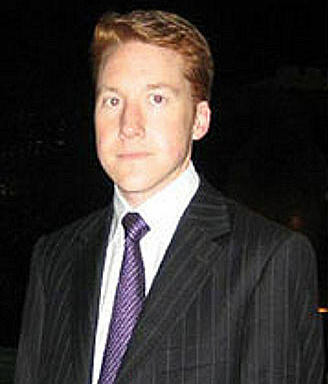 His focus on quality, helps you to lift your mediocre standards. His approach is simple and effective. Igor's tuition comes from his own experience, so he knows what he is talking about. As Igor states 'proved by practice'. However, such a serious teacher requires a serious and aspiring student, and if you are willing to accept his recommendations then you will achieve your chess goals. 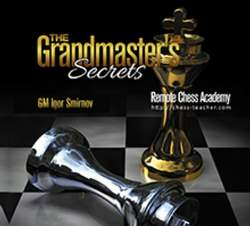 Get the Video Course "The Grandmaster's Secrets" - Click here! "The only thing I regret is I lost so much time looking for such a course!" 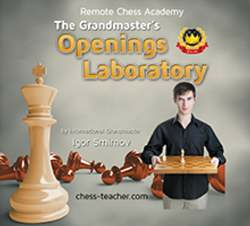 "I've started Igor Smirnov's "Grandmaster's opening laboratory" recently. I was sure I would have any results after I have finished it. But my chess skills are improving so fast that I decided to share my results for today with other chess funs. Yes, I'm just a chess fun! The course is so easy to absorb that even beginners can use it without any difficulty. 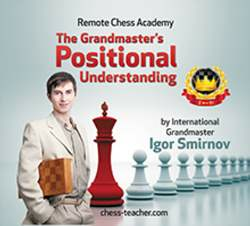 I.Smirnov leads you during the course, answers all the questions arising, explains everything in a very simple way. I'm advancing step by step and believe in becoming more and more confident in chess by the end of the course. My father was a professional chess player. He left me a lot of books on chess theory -from easy ones to very hard. I tried to learn them by myself but gave up many times. Why? Because I got lost in the information. Now, after I. Smirnov's recommendations the openings in the theory books are very clear to me to choose. 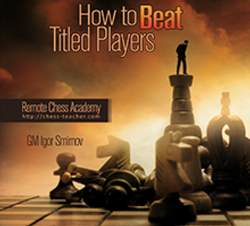 I appreciate I.Smirnov for sharing the opening secrets with anybody who is really interested in chess. Learning chess with such a professional coach helps to improve the ability of thinking in advance, analyze the situation, build a good strategy and tactics to achieve it. The only thing I regret is I lost so much time looking for such a course! So, I advise you not to waste time and start it. 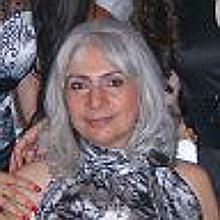 I would like to finish with saying "There is no limit in what you can do, once you put your mind to it". And chess is no exception."